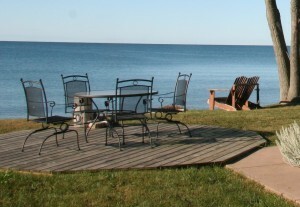 Serenity Bed and Breakfast is nestled on the north shore of Lake Ontario at about the mid point of this great lake. Yet only minutes from the town of Brighton Ontario. I am an old sea dog and I have lived on the shores of Lake Ontario for most of my life. A powerful and beautiful lake, it never seizes to provide inspiration and entertainment during all its beautiful seasons. I can share many stories of both the lakes furry and tranquility. And here I will share some stories of others that have experience the grandure of this enchanting lake that our province was named after. 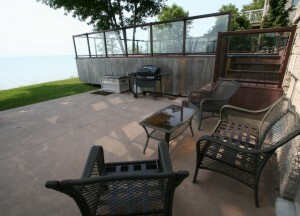 We consider ourselves fortunate to be here where we enjoy the relaxing atmosphere in a new luxurious home that was built to drink in the amazing vistas the the lake front brings to each and every day. 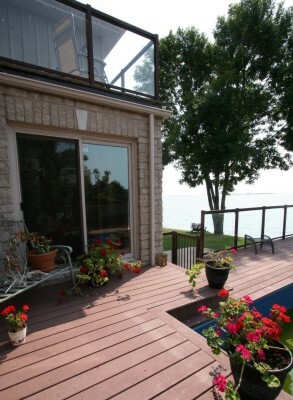 It features several private decks and patios that all provide beautiful waterfront views. I can look out on the lakes horizon without being drawn into thoughts of its history and its profound impact that it has had on the lives of those who have lived around its shores for hundreds of years. So here I will share some photos of our little castle on the lake while I share some of the stories that reflect the cultural heritage of this great lake. The first story I will share is of a sailor and one voyage across the lake. This was a special crossing. We have sailed across Lake Ontario at least twice a year and sometimes more for 26 years. This one was the one to remember. 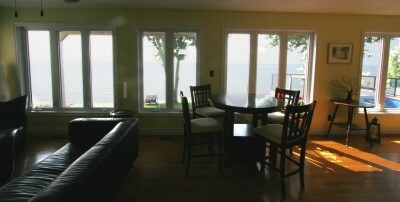 As I write this the morning after, the room feels as if it is still moving with the rhythm of the lake. Lake Ontario, forms part of the border between Canada and the United States. Although the smallest of the Great Lakes at 193 miles in length , a breadth of 53 miles, and maximum depth of 802 feet, this is a significant body of water. This year’s vacation cruise got shoved back into September because of a series of conflicts and disasters and parts failures on the boat. We turned the schedule over to the Lord asking Him to provide for the best. We left Rochester Thursday Sept. 5th knowing that we had to be back no later than Sunday the 14th. We had beautiful summer weather. It was much warmer than normal for most of the week. Our first crossing from Fair Haven NY to Wapoos on the north shore of the lake was a nice sail in west winds that never got over 10 kts. We anchored and laid over behind Wapoos Island and kept cool by swimming every couple of hours, it was that hot. We made our way back through the protected waters of the Bay of Quinte a series of lake like bodies of water north of the almost island of Prince Edward County. http://www.bayofquinte.com/site/maps-directions/ is a site that shows the map of the area. Presqu’ile Bay is to the south of Brighton on the map and is reached by traveling west through the Murray Canal, part of the Trent Severn canal system. This bay is a jump off point for cruisers heading across to the south shore or west to Toronto. Wednesday the 11th we holed up in Bellville because of gale force north winds. Thursday we got to Presqu'ile and waited out 30 kts. overnight southwest winds. Winds were forecast to veer to west 10 to 20 kts. by Friday Morning. Saturday was forecast to have building winds from the South and Sunday was worse with a powerful cold front coming in from the west. Friday was our window. We changed to our working jib and reefed the main while still at the dock. A couple heading for Toronto radioed us from the out in the lake that the wind was west with seas 6 ft. with occasional white caps. That seemed OK since the weather forecast was for the west winds to diminish and back to southwest. It was 10:30 AM. When we got onto the lake and unfurled the jib we saw that we needed the reefed main as well to power through the southwest swells left over from the night before. Maranatha, our Pearson 30 sloop was sailing very comfortably heeling about 20 degrees on a beam reach in westerly's that were close to 10 kts. It looked like it would be a fast passage of the 47 nautical miles south to Rochester. Around noon we were noticing more westerly swells being added to the southwest making the seas confused. They were steepening up and I became the helm person of choice. The west wind had built to 15 to 20 kts. I was now concentrating on keeping the boat mounting the fronts of these seas as they came sweeping towards us. We were both tied into the boat by tethers attached to harnesses in our inflatable life vests. About the time one of the waves rolled us and put the winches in the water we decided to put the cabin slides in to prevent the cabin from filling if we did get a serious knockdown. This was a bright blue sky day. The seas were dangerous but beautiful with the sun glinting like silver off each of the wind whipped facets on their surfaces. I now had to concentrate fully on each approaching wave. I found that if I looked away even to check the compass course, a wave would catch us and either start to roll us or the boat would drop off the back of the wave with a bang and a lurch. Linda and I had been praying separately and had sung our hymn, “Fear not for I have Redeemed Thee” from Isaiah 43:2 &3. I had been asking Jesus to calm the waters as He had for the apostles on the Sea of Galilee. I got an answer to prayer. God, as he so often does, doesn’t change the circumstances but changes our thinking about them. I realized that I had a choice. I could entertain fear or I could reject fear and live life one wave at a time. I told Linda about how these waves, which by now were looking more like something out of a white water rafting video than waves on a lake, were the Lord’s creation. We are His created creatures. We are here experiencing His water world in a very privileged way. We can be present to each wave as it comes. Experience it for what it is, and not fear it. Then we can experience the next one, being part of it. And we can do this for as long as it takes and not dwell on how-much-longer-must-I-endure. Conditions got worse. We were at mid lake by now. We had picked up a third wave train, northerlies left over from the gale of two days ago. The westerly swells were huge by now. We were experiencing the full 100 nautical mile fetch from the west end of Lake Ontario. I would see off to windward three of these monsters running as a unit out ahead of us. Their tops were breaking into white water as they came on. When we met them I would angle Maranatha diagonally up the steep face keeping up boat speed. We would crest the monster. Then stare down into the abyss, the trough between the first and second wave. It looked like a ski hill. Down we’d go, trying to keep up boat speed to get over number two. How high was that thing? Not a chance that I could look away to compare it to the mast height. Over number two. Now the abyss again. Keep the speed up, mount number three. At the top we get pushed forward by a northerly swell right on top of the monster. I saw waves breaking into foam from two directions creating a frothy vee. But I was in the God given zone. Grace to overcome adversity, sufficient for each wave, then onto the next. I had the peace that passes understanding. Well one more thing was added to the mix. Lake freighters. Ahead as we rode out of the troughs I saw a freighter. She was one or two miles away but which way is she heading? How do I pass behind her? The cabin is sealed I can’t even radio her to ask. Linda is taking bearings in the wild water ride created by the three converging wave trains. Every few minutes a wave on a wave will smack the topsides and come aboard soaking us with the warm water. I’m really thankful this is fresh water and not salt hitting me in the face and eyes. Linda thinks she’s westbound. We are getting closer and the bearing is not changing. That means a collision course. Finally the freighter is moving across our bow. It’s eastbound. I can pass behind easily with out having to tack away. Less than 15 minutes later there is another freighter, closer this time and more up wind. I’m seeing her port side, can I go ahead of her? I don’t want to try but we are moving fast enough to make it close. I have to slow the boat down, but not too much, can’t let the boat stall going up the face of these monster waves or we’ll get thrown back on our rudder. That could do some real damage. Between the biggest waves I pinch upwind to luff the sails and slow us down. Slowly we see more of her port side and she passes ahead and I can fall off and get the boat speed up again. We are half way across to Rochester. Conditions don’t get worse. W e are moving, rising and falling with each wave one at a time. An hour later conditions are less severe. We are starting to feel the lee effect of the south shore cutting down the southwest swells. We are getting more of the northerly swell but much less of the southwesterly. We are surfing towards the south shore on some of these northerly swells, which are right on top of the westerly's. By now we are seeing some of the larger buildings of Rochester as we rise to the top of the waves. The largest waves are running a measly 6 to 8 feet. 10 miles out of Rochester the seas are much calmer. We shake out the reef in the main because the wind has dropped and boat speed is below 5 kts. Within 5 nmi. of the shore the wind dies then backs to southwest and builds for a magnificent sail, close hauled on starboard tack, right to the breakwater of the Genesee River. It’s 19:00 hours, the sun is setting and we’re home. We have had a daylong experience living moment by moment sustained by grace, in God’s wonderful water world. Praise the Lord. The Second Story is about being grounded when you least expect it. Ever witness, from shore, a vessel in a state of immobility? I am referring to a private yacht, which has come into contact with the bottom of a channel, or shore. Have you thought of how that sailor, who might be a very well seasoned, or novice sailor, could let that happen to him or his crew, or even his family? Such an experience occurred to me, while scrambling to bring back my vintage Ericson 35 MK II sailboat back to a marina, not fewer than 10 miles East from where I had it docked for the summer. The early evening was just right to make the trip: plenty of wind and good weather helped me to have some confidence in taking my boat, Tristan, back to have it hauled out for the winter. You see, at the Pultneyville Yacht Club, along the shores of Up State New York, on Lake Ontario, hauling out your boat meant doing business with a 80-ton portable crane, and pulling the stick was performed by the boat owner, and a few helpful friends, if so available! 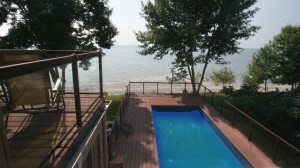 That summer had showed us an unusually low water mark, and for Lake Ontario, that meant for a high step from your deck to the dock, and deep draft boats were in constant danger of scraping the bottom. Worst yet, sucking in mud and silt into your engine s intake. the channel, which was at somewhat north of the gin crane, by about a few hundred yards. By steering the boat to starboard, I aimed dead center of the channel, and increased the engine speed to about ¾ throttle, to attain a hull speed of approximately 6 knots.I did not make it very far though; only half way out of the channel. I felt the boat raise itself a bit, and settle back down, only to come to a dead stop. I was comfortably grounded in what seemed to be a cradle of some sort, holding fast the keel of my boat, in a tight grip. I maneuvered the boat with the engine in forward and reverse, at high speeds, only to find myself immensely held into place without any reprieve. For a boat that only drew 4 10", I was in a terrible fix. Night was falling fast, I was the only person on board, and no one was around to help since it was a Monday night in the Fall season, and most boaters were back home, preparing for another workweek. I tried rocking the boat back and for the, side to side. Nothing! The motor just revved in place, and of course overheated since the large water/sediment separator was plugged once again. An was an easy fix: unscrew the 2" cap, pull out the strainer, dump out the sediment and grass, and reinstall. After about 1 ½ hour of trying to get the boat out on my own, someone from shore noticed a mast over the horizon from their location, and after realizing that it was not moving and seemed to be fixed in place. Coming over to investigate, and noticing a poor stranded sailor in the middle of a channel, he walked around and over large granite channel blocs, and called out to me: "Everything OK?" "Stuck!" I shouted back. I must ad here that I am not light hearted. But being 30 feet off the water at night, with a mast which reflected the slightest movement of the hull against the incoming swells, and tended in a bosom s chair by two strangers was not my idea of fun! Once a rope tied below the uppermost spreader, down I came, and the crowd onshore gave it a Heave -Ho, pulled my boat to a 45-degree angle, and off came the boat from its resting place! Max throttle reverse, back to the slip (did not seem like a good night to be about), and one week to await for the crane to pull me out for the winter! Again, back to the hand gin crane the next day, and removing the stick to then secure it in the mast rack, provided by the yacht club. The only thing I had to do now, is build a substantial cradle for my boat in one week Isn't sailing worth the effort? I will bring you more stories of the lake here as time passes. But for now I am going to take some time to enjoy living on the shore and spending time with a pen in hand. Besides the water, words are my other best friend. The quiet corners at Serenity provide a space to relax and read a book or meditate on wonders of our world and the privilege of indulging in its treasures. A beautiful retreat from the hustle and bustle of modern day life, Serenity offers a true getaway experience and a chance to explore yourself and your life from a completely different perspective. This unique retreat offers you comfortable private suites with many amenities. 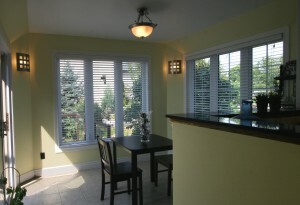 Enjoy all Serenity Bed and Breakfast's facilities, lounge by the fireplace, or relax on the decks. Step outside to our private pool that looks across the lake or stroll the beach or walk or bike to near by nature trails to participate in bird watching or hiking. Explore the magical country side that surrounds Serenity Bed and Breakfast. You may even want to take some time to enjoy a story or two or curl up with a good book and retreat in the a world of your own. So join us and enjoy the peace and tranquility of our little oasis far from the rest of the world. Our reasonable rates and special packages provide an affordable retreat experience for up to 8 guests that integrates fun, learning, relaxation and rejuvenation in the midst of Serenity's natural surroundings. Your hosts are very grateful to have the opportunity to share with you this oasis from day to day life and invite you to experience warm hospitality surrounded by beauty and peace at Serenity Bed and Breakfast.